In my 29 years of involvement with the Toronto Blue Jays as their chapel leader I never really got to know Roy Halladay. He was always cordial, quiet, reserved, very professional and well-prepared for every game he pitched...the consumate pro. 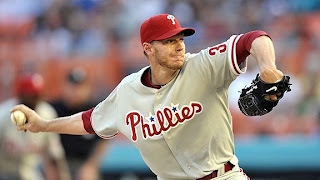 In the off-season he was signed by the Philadelphia Phillies and is off to a great start. It was SO good to read tonight that Roy (or Doc as he is often called) pitched a perfect game against the Florida Marlins. 27 batters faced, 27 batters retired. No hits, no walks, 11 strikeouts. What a performance! CONGRATULATIONS, Doc! We miss you in Toronto!